This Daruma can play janken、じゃんけん【じゃん拳】 the game of “scissors-paper-rock”. An operator can move the hand. It is about 16 cm high. Rock-paper-scissors is a hand game played by two or more people. The game is also known as roshambo, or another ordering of the three items (with "stone" sometimes substituting for "rock"). The game is often used as a selection method in a way similar to coin flipping, drawing straws, or throwing dice. 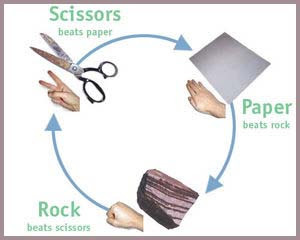 However, unlike truly random selection methods, rock-paper-scissors can be played with a degree of skill, especially if the game extends over many sessions with the same players; it is often possible to recognize and exploit the non-random behavior of an opponent. According to the Chinese Ming Dynasty writer Xie Zhaozhi's (谢肇淛) book Wuzazu (五杂组), the first known mention of the game, the game dates back to the time of the Chinese Han Dynasty (206 BCE – 220 CE), it was called shoushiling (手势令). Li Rihua's (李日华) book Note of Liuyanzhai (六砚斋笔记) also reveals this game, calling it shoushiling (手势令), huozhitou (豁指头), or huoquan (豁拳). In the 18th century these games were popular in Japan. 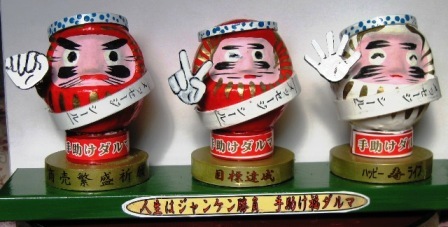 It's known in Japan as Jan-ken-pon (じゃんけんぽん), more commonly called janken (じゃんけん) and sometimes called rock ken (石拳, ishiken). The origin or the derivation of the name is unknown. 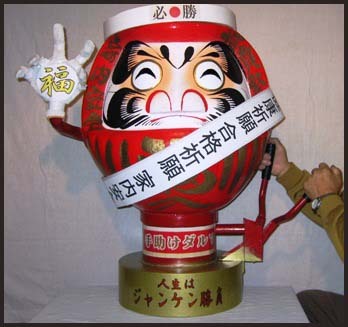 Ken (拳, ken) is a fist in Japanese and Jan-ken-po is categorized as a "ken (fist) games" (拳遊び, ken asobi). Janken is believed to have been based on two older ken games, sū ken (数拳, number competing game with fingers, likely similar to or identical with Morra) and san sukumi ken (三すくみ拳, san sukumi means the freezing aspects of a snake, frog, and slug with fear). San sukumi ken has existed in Japan since ancient times, and sū ken was imported from China in the late 17th century; the name in China of sū ken is shoushìlìng (手勢令). 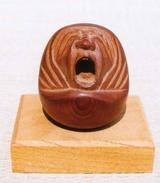 Ken games began to increase in popularity in the middle of the 19th century. Rock-paper-scissors came to be played all over the world by the 20th century.
. What, this is supposed to be haiku ? .
. Games with Daruma .